Growing up, I didn’t eat a lot of rhubarb. Maybe there wasn’t a lot of rhubarb in West Texas as that time because fruits and vegetables didn’t fly around the world like they do today. Perhaps Papa Daddy didn’t like rhubarb. Or it might not have been on Aba’s radar screen. Regardless, I found rhubarb late in life and I fell in love. 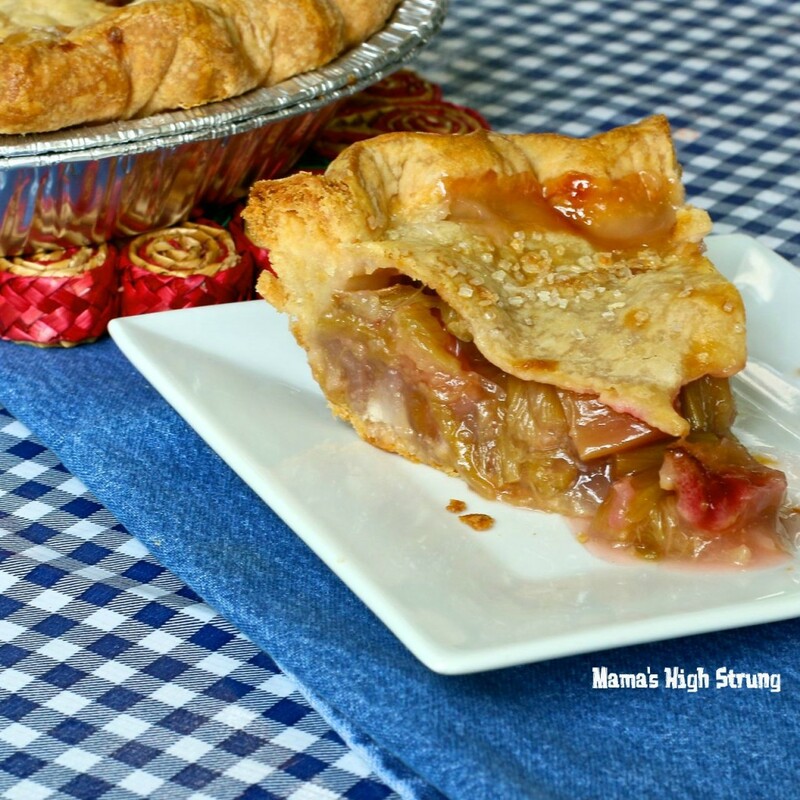 My favorite way to enjoy rhubarb is, like most people, in a pie. 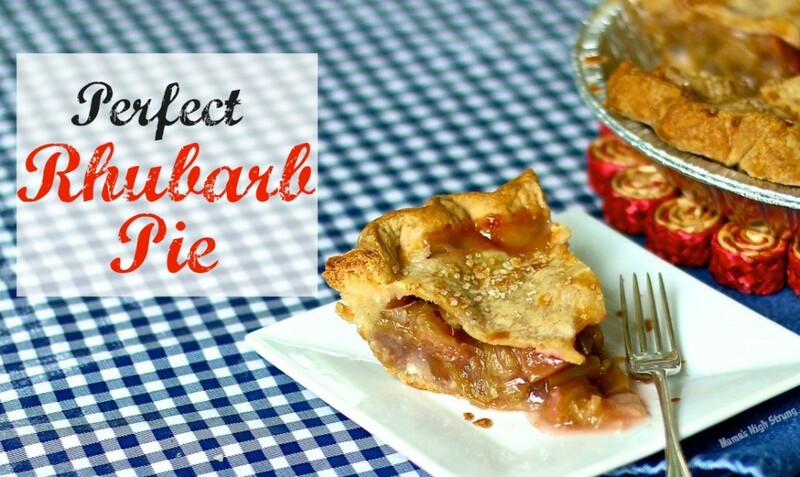 I love this recipe for Perfect Rhubarb Pie because it’s so simple. Tart, but sweet (like me!). I know the recipe looks long and involved, but that’s the fault of the delicious Vodka Crust. Use a refrigerated pie crust, if you prefer. I’m going to be taking some time off to pursue some other writing projects. I’ll be posting some of my previous recipes with (much) better images. I’ll be checking my email so please leave comments, suggestions and share my recipes (please!). Mix half of the flour, sugar and salt in a food processor for 2-seconds. Add the butter and shortening and pulse about 10 to 15 times or until the dough looks like cottage cheese and there is no loose flour. Scrape the bowl and then add the remaining flour and pulse 5 or 6 times. Remove the dough from the food processor and place in a medium bowl. Sprinkle the vodka and water over the dough and fold until the dough sticks together and all of the liquid is absorbed. Divide the dough into 2 balls and flatten into 2 4-inch disks. Wrap tightly in plastic wrap and refrigerate for 1 hour. While the dough is resting, mix the sugar, arrowroot and salt together in a bowl. Add the rhubarb and lemon zest and toss gently to combine. Set aside. After the dough has rested, move oven rack to the lowest position and place a baking sheet on the rack. Preheat oven to 425°F. Dust the rolling pin and work surface with flour. Remove one dough disk from refrigerator. Roll dough in a circle to a uniform thickness (about ⅛-to-¼-inch thick), about 1-inch larger than an upside down 9-inch pie plate. (Turn the pie plate upside down on the dough to measure it). Place rolled-out dough into pie plate and press gently into form of plate. Trim excess (but don’t throw it away! ), leaving about ½-inch overhang. Pour the rhubarb mixture into the pie plate. Dust the rolling pin and work surface with flour one more time. Roll dough in a circle to a uniform thickness (about ⅛-to-¼-inch thick), about 1-inch larger than an upside down 9-inch pie plate. Cut out flowers or shapes with a small cookie cutter. Place second rolled-out dough on top of rhubarb mixture, being careful not to tear the dough where you made cutouts. Roll up and pinch the edges so you have a nice thick fluted edge (use the extra trimmed dough if necessary). Brush half of the beaten egg on top of crust. Place the little cutout shapes on top of crust. Brush with remaining egg mixture and sprinkle with demerara sugar if using. Place the pie on the preheated baking sheet and bake for 10 minutes. 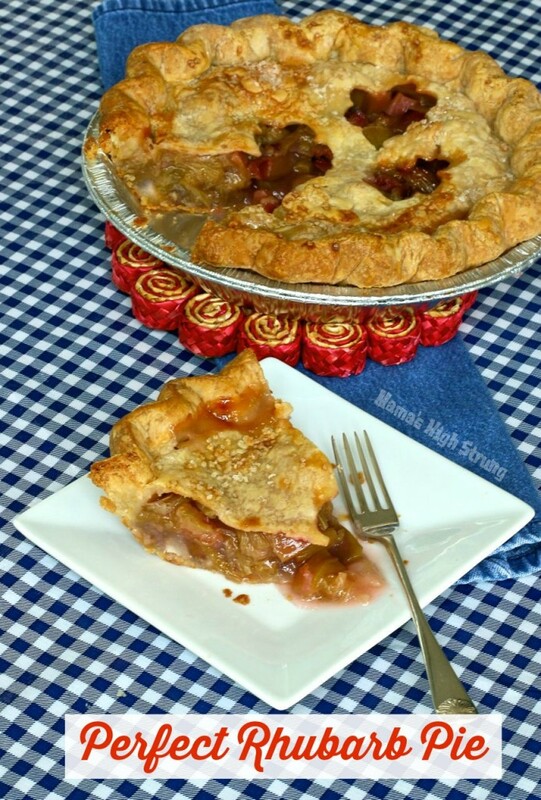 Reduce the heat to 350°F and bake for 30 to 40 minutes or until top is golden brown and the rhubarb is tender (poke a skewer through one of the holes in the crust to check). If crust browns too quickly, cover with a piece of foil. Remove from oven and cool on a wire rack at least 1-hour. I have never had rhubarb pie before, in fact until recently I had never even heard of rhubarb at all. I guess I live in the stone age. While visiting family in Michigan last week, my uncle pulled up a piece and made me bite into it. I quickly spit it out, handed it back to him and said thanks a lot. He said well its much better cooked and with some sugar. I was like hmm you think? If I get my hand on some, I’ll try your recipe for sure! What a prankster, that uncle of yours. Yes, yes, yes… it IS much better cooked and with sugar. But I do like the tartness that it brings to a pie. Let me know if you try this recipe!